LG Chem has announced that it now has curved batteries in mass production, which will fit in not only phones but also glasses and watches. The curved design makes them ideal for phones with the curved displays that LG and Samsung are currently working on. But that's not all. The company has also developed a 'stepped battery', which it's already using to fill extra space in the LG G2. Essentially it adds a little hump, or 'step', to the battery which can fill empty space in the phone and give it a bit more capacity. 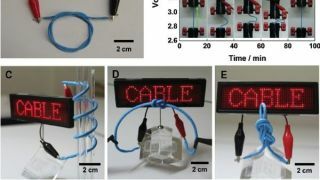 Most exciting of all is its plans for a cable battery, which is exactly how it sounds, a battery in the form of a cable. It can be bent and even tied in a knot and it won't heat up during use. As intriguing as it sounds it's not here yet, as LG states that it will arrive in 'upcoming years'. When it does arrive it could be a game changer, adaptable enough to fit in almost any device and perfect for flexible devices, such as smart watches, which could benefit from a battery that can bend during use. Along with LG's curved displays it seems like the company really has a thing for products that bend, but if it means we can eke more life out of our smart devices then they can make a slinky battery for all we care. Want to get more out of your current phones battery? Check out these handy tips.